20/92 David Mumpower After watching this movie, I called my cable service and complained about not having The Ocho. 25/126 Kim Hollis Possibly the funniest film since There's Something About Mary. 36/48 Les Winan Ben Stiller needs to find a new character. I'm tired of "over-the-top-intense-guy". Note: When this write up was written, the title of movie was "Underdogs". Sadly, this film isn't actually based on the wonderful 1960s animated show, but a girl can certainly dream, right? I'm taking consolation in the fact that it instead stars one of my favorite actors in the business, Ben Stiller. In this case, he's again working with his wife, Christine Taylor, with whom he teamed in the marvelous comedy about the fashion industry, Zoolander. Vince Vaughn will be there, too. The movie itself revolves around a group of misfits who enter a Las Vegas dodgeball tournament in order to rescue their cherished local gym from the impending takeover by a corporate health fitness chain. 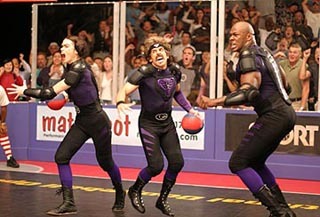 To my mind, there just aren't enough movies about nerds playing dodgeball. For those of you who never saw it (99.9% of you, judging from the show's ratings - for shame! ), Freaks and Geeks was a perfect illustration of the sequence of events that usually occurred during a dodgeball match. Teams were picked, with captains grudgingly taking the nerds and dweebs last, and then the fun began. In a textbook illustration of natural selection, the jocks took aim at the weakest of the weak, the bookish types with the horn-rimmed glasses and pants that never fit quite properly because of all the wedgies they received.